← It Might Have Been. 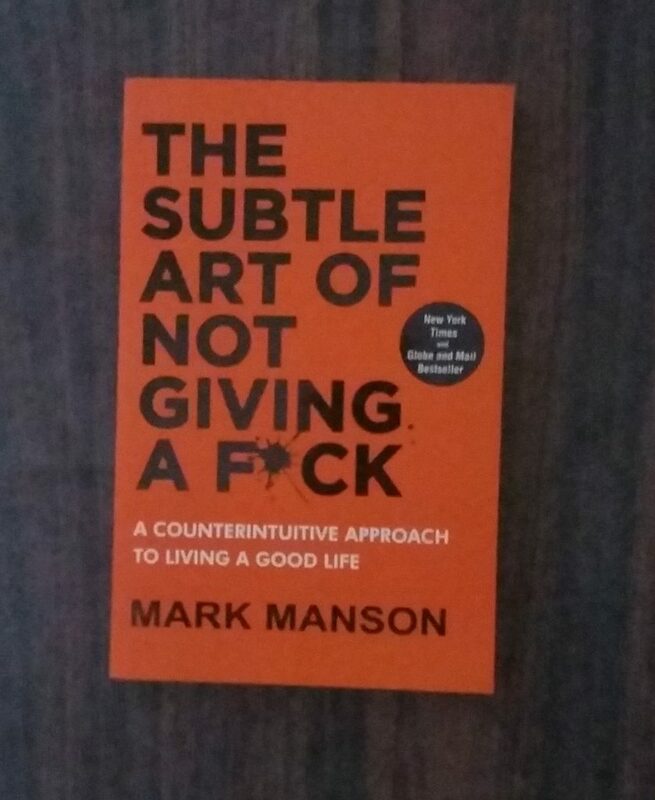 Book Review – Mark Manson. In my post An Unexpected Gift, I had undertaken to review the book that I had received as the gift. I also take you to Ekoshapu’s post where he wondered if I would comment on two observations that he made there and I will combine both the review and my comments here. First the language. Having braced myself for a barrage of foul language based on various comments and the reviews that I had read, I was pleasantly surprised to find the four letter word more or less disappearing after the first couple of chapters. Once Manson gets into his stride with his message, he does not seem to require the crutches of the f*** word and the reading becomes quite placid. Towards the end he does use it a few times but not to the same intensity as he does in the beginning. Now to the content. As self help books go, this is one that people of my age, Tammy and Monk, I hope that you agree, can safely ignore. Unlike Manson who is now is his thirties and still with a long life ahead of him, there are two issues that we do not need to address. One, we have nothing to prove to anyone including ourselves, and two, we are quite familiar with the prospect of impending death. The other recommendations that Manson makes will perhaps be of use to younger, and particularly Western and Westernised Indians grappling with the pressures of modern living and expectations. In other words, people of my age, both Western and Indian have no need for this rethinking. We made our mistakes and learnt from them in a different world with different value systems. It is still a good read. If you are the type that would like to learn how young minds work now, this is the book for you. 1. You can’t be an important and life-changing presence for some people without also being a joke and an embarrassment to others. I am in total agreement. Over the years, I have come to accept that I will not be universally popular and that there is no point in running a popularity contest. There will be people who will like me for what I am and more who will think that I am not worth a thought. This is indeed life and the sooner one learns this, one’s expectations from relationships of all kinds become realistic and manageable. Manson addressed this issue to those people who want to be liked by everyone. An impossibility. 2. Our culture today is obsessively focused on unrealistically positive expectations: Be happier. Be healthier. Be the best, better than the rest. Be smarter, faster, richer, sexier, more popular, more productive, more envied, and more admired. Be perfect. It is. No doubts whatsoever in my mind and my response is that I am not a participant in that value system. I am at the twilight of my life and am content with the way I am and with the things that I have. I am in the process of getting rid of things rather than acquiring them and that includs value systems too. I have nothing to prove to anyone, not even to myself. I would like to share my experience when it comes to item number one too. Who you are is defined by what you’re willing to struggle for. It’s the most simple and basic component of life. Our struggles determine our successes. An issue that Manson treats with great attention is “Commitment”. To Ekoshapu, I point out that this is the single most important value to take away from the book. I speak from experience. This entry was posted in Blogging, Books / Reading, Self Improvement, Values and tagged Mark Manson. Bookmark the permalink. 12 Responses to Book Review – Mark Manson. I’ve been lucky like you — I never got suckered into doing things to impress other people. I suppose the words to describe my approach are: patience and persistence, commitment and practice. Be curious and open to life. No matter what happens keep learning and growing. Find what you love and find a way to share it with others. Those four words feature quite prominently in Manson’s formulae. Great post. Also, the Basho quote is a favourite – I’ve lived by it for the past seven years, but it is a learning that has been, to put it mildly, hard-won. Yes, the hardest part is in the letting go and allow the river of life to flow. I was able to do this when I was exposed to Vedanta and realised that I was already privileged. from one who has liked you from the beginning. As I am with all of them too Tammy. I enjoy company whenever I get it and am blessed with enough caring people who make that possible. Yes, it is sad that there are so many people who are like that and I have mentioned that in my comment by agreeing with the statement. I don’t have to be, and from what I have learnt about you, you are not one of those either. We don’t need negativity in our lives. Over a period of time, such people have learnt not to come close to me and I am the better for it. I to never struggled for personal or financial gain until retirement, but I am coming to understand that even now there is no struggle as I in fact have all that I need. Except my late wife. And during my sport participation time I did try to do certain things to impress other people. I did too Shackman and I suspect that when young, we all do. As we grow up, we stop that nonsense and post retirement it all seems so silly! I stopped reading self help books quite a while ago. My theory was I carve my own path, we are all unique. And learning from our own experience, either repeating mistakes or moving on and away. I don’t enjoy people who are “stuck” afraid to move forward, afraid to risk, afraid of others’ opinions. I look around the creative rooms I frequent (by invitation) and sometimes notice I am the eldest by far but mostly I shed the cloak of years and listen, learn and offer my own ideas. My greatest joy is the endless possibilities of my existence, denied to so many. I would not have read the book had it not been gifted to me with so much affection by that young lad. I owed it to him to read and review. In retrospect, I am glad that I did.